The Dressmaker film premièred at the 2015 Toronto International Film Festival on the 14th September 2015, and was released in Australia and New Zealand on the 29 October. The cast and film won five awards at the 2015 AACTAs: Best Lead Actress (Kate Winslet), Best Supporting Actress (Judy Davis), Best Supporting Actor (Hugo Weaving), Best Costumes (Marion Boyce and Margot Wilson) and the People’s Choice Award for Favourite Australian Film. Produced by Sue Maslin (Japanese Story, The Road to Nhill), the film was shot in Victoria. Jocelyn Moorhouse (How to Make an American Quilt, Proof) adapted the novel for film and describes the story as ‘Unforgiven with a sewing machine’. Jocelyn also directed the film. Kate Winslet plays Myrtle ‘Tilly’ Dunnage, the stylish young woman from Dungatar who returns to her hometown after a long absence, reminding the locals why they expelled her in the first place. Oscar nominated actress Judy Davis plays Tilly’s ailing but mischievous mother, Molly, and Teddy is played by Liam Hemsworth (Hunger Games). The cast also features Hugo Weaving, Rebecca Gibney, Shane Jacobsen, Caroline Goodall, Sacha Horler, Sara Snook and many other stellar Australian actors. The film crew included director of photography Don McAlpine (X-Men Origins: Wolverine, Moulin Rouge! ), production designer Roger Ford (Chronicles of Narnia) and editor Jill Bilcock (Moulin Rouge!). 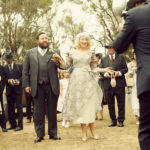 The Dressmaker received twelve nominations at the 2105 AACTA Awards, including Best Film, Best Direction, Best Lead Actress, Best Supporting Actress, Best Supporting Actor, Best Production Design, Best Original Music Score, Best Sound, Best Editing, Best Costume Design and Best Cinematography. Read more about the film at the official dressmakermovie site.